You say tomay-to, I say pomodoro. For those who have eaten a pizza or some tomato based dish in an Italian restaurant you will know pomodoro translates as ‘tomato’. What the hell is this guy talking about? Tomato’s? How the hell does a red fruit, often wrongly accused of being a vegetable have anything to do with writing? Well, it all comes down to a productivity technique named after a tomato. Specifically, an Italian man, Francesco Cirillo found that his productivity was not as he wished. He tried different ways to rectify this problem and discovered that if he dedicated 25 minutes to a task, had a complete break for 5, returned for another 25, had a total break for 5 and had a final session of 25 minutes he achieved a greater deal than slogging away at something all day. The idea is that your flow is not interrupted so you can concentrate with maximum attention rather than having distractions interrupt whatever task you are attempting. I’m going to try this tomorrow as I have a bad habit of sitting down for hours doing something, writing or university work, which probably doesn’t help. An additional aim is to tick off things you intended to achieve which gives a greater sense of satisfaction once done, a visual reference that work has happened. I think this in particular is a good thing in the virtual world of writing. Sure, there are words on a screen, but they don’t necessarily equate to a concrete accomplishment unless printed. I compare it to working as a builder – they see their work in progress, constant concrete visual reminders (pun subconsciously intended). Whereas office workers using computers do not have this same degree of satisfaction – completing a report has a positive feeling but there isn’t the tangible reward of seeing a real life structure come into existence. 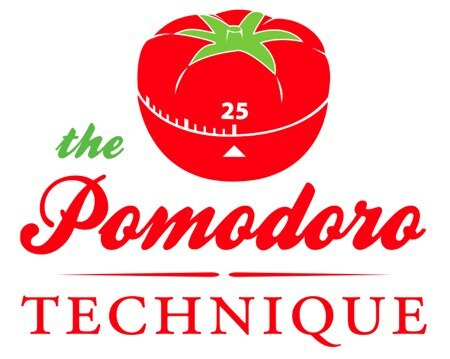 *Incidentally, the ‘pomodoro’ part comes from a cooking timer in the design of a tomato.